After treating ourselves to a fun day painting the living room yesterday, we decided we were due a spell of relaxation and, as today looked as if it might be halfway decent, we took ourselves over to Wythop for a leisurely stroll on Sale Fell. This fell isn’t one of Lakeland’s giants by any means, it stands at only 1177′ above sea level, but it offers a variety of routes over and around its modest slopes all of which will provide a grand little walk through some very pretty countryside, especially on a sunny day. We parked on the narrow lane which runs between the Pheasant Inn and Wythop Mill and made our way along to this gate which marks the start of one of the paths up Sale Fell. The narrow lane is in those trees just below the gorse and having gone through the gate we have a short climb through the flowering gorse to the top of the rise, behind us is this view of Binsey across Bass Lake. Tucked into the trees is St Margaret’s Church, consecrated in 1866, which replaced the previous old chapel which we will be passing a little later on in our walk. A memorial bench has been sited on the flattish area at the top of the rise and the previous photo shows the view from it. From the bench area we take a sharp left and begin the climb up the wide grassy path en route for Lothwaite. A couple of walkers up ahead of us are already well on their way, but we were to come across them later on in our walk. More of Bass Lake appears as we gain height. A look back across Embleton vale as the path crosses through the collapsed wall. A little further on and we have crossed a small beck and carried straight on instead of turning up Sale Fell, that’s it behind us with its summit in the cloud shadow. Ahead of us we still have the wide grassy path leading us on to Lothwaite. To the left of the shot is an area of scrubland which was covered with pine trees until they were felled in 2014. Barf and Lord’s Seat on the centre skyline, with just a hint of Grisedale Pike appearing behind on the right as we reach Lothwaite. A closer look at the Dodds and the Helvellyn range on the skyline from Lothwaite. The abundance of clouds was playing havoc with the lighting today and strong shadows were hard to avoid, but the view across Bass Lake was still fantastic. The Lord’s Seat fells again as we continue over Lothwaite …. ….. and a view of Sale Fell as we walk across a very windy Lothwaite. As we look to our left we see Broom Fell on the centre skyline with Greystones to its right. Another nicely sited bench with a view below us where we decided to put the jumpers back on again. It might look warm and sunny but the chilly wind was coming straight at us and our short sleeved t-shirts just weren’t cutting it. From Lothwaite we had a comprehensive view of the deforested area just across from us. It didn’t look as though new trees had been planted so perhaps its being left to revert to a natural state. Looking across the Wythop valley with Broom Fell on the left and Greystones on the right. Today’s cute lamb and Mum keeping a very close watch on me. Barf, Lord’s Seat and Broom Fell standing guard above the lovely Wythop valley. Another area of deforestation across the valley with Ling Fell to the right of it. Looking towards Binsey from the large cairn on Rivings. From Rivings we make our way over to Sale Fell. We’re in deep shade and a very chilly wind as we cross over to Sale Fell and we both started to feel quite cold, my fingers were beginning to go numb and I hadn’t packed my gloves. I didn’t think I would be needing them today! Another look across the valley at the Lord’s Seat fells as we reach the top of Sale Fell. 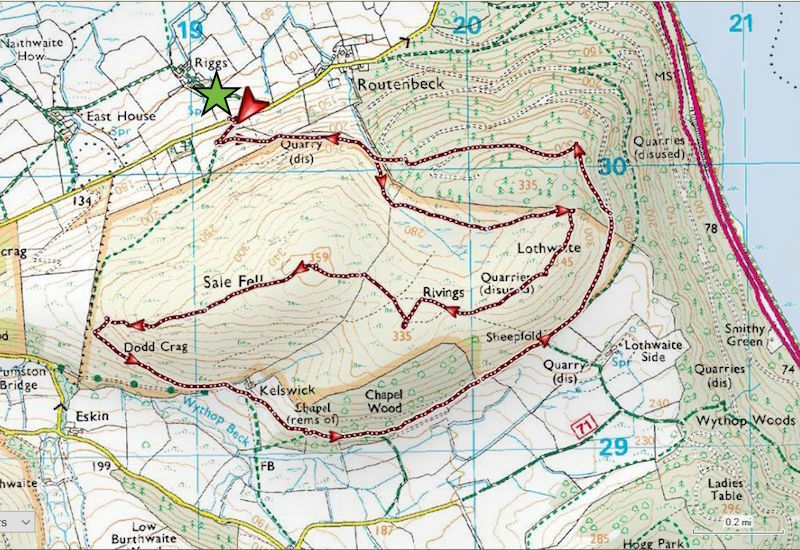 From Sale Fell we can look at quite a lot of the route we have been taking, the deforested area to the left, the grassy area of Lothwaite to the right of it and then, where the paths are criss-crossing is Rivings. A closer look at the Skiddaw group, Skiddaw being the highest one on the skyline, below it is the Ullock Pike to Carl Side ridge, and then comes the little rounded hump of Dodd. Binsey viewed in close up from Sale Fell top. Time to get a move on because its too chilly and windy to stand around any longer. The gloves are out and shortly after this shot we put our jackets back on. We’re now walking down directly into the wind, and we also have a large cloud overhead, so everything feels even chillier and I’m glad we didn’t opt for any of the higher fells today. The higher you go the colder it gets and its parky enough down at this modest height, is it ever going to warm up? A look back at the descent route off Sale Fell. We’d almost reached the wall when we spotted a little hollow which looked like it might offer a bit of respite, which it did, so we dropped into it and got out the coffee. We were both very cold by the time we reached here so we were looking forward to a hot drink and hoping for a spell of warm sunshine. The big cloud finally moved away from us and we had a sunny ten minute break, while our chilled bodies began to get some warmth back into them. This is the view we had of Ling Fell across the valley while we had our coffee break. We thought about continuing the walk by going over to the top of it but decided instead to swing left on the path at the lower left of the shot and return back along the Wythop valley. So here we are, making our way along the valley back towards Kelswick Farm. A look back at Ling Fell as we make our way along the valley. There is another path below us alongside the beck, which you may be able to pick out, and the one we are on merges with it a little further along. Whichever one is chosen the walk through the valley is a lovely one, especially on a sunny spring day like today. We now have the wind behind us and its much warmer down here in the valley so the walk along here was very pleasant. Looking ahead at the gentle countryside along the Wythop valley. This is Kelswick Farm where the two paths merge and we continue on along the tarmac lane to the point where the lane begins to curve around behind the trees. You can just make out a signpost at that bend and there we leave the lane and continue on a track across the field. The track passes alongside the ruins of the old chapel at Wythop which I mentioned at the beginning of the walk and which was erected in 1673. On one of the remaining walls there is a photo of how it once looked but it is now so faded that you can hardly see any detail on it so I didn’t think it was worth taking a shot of it. This is a lovely section of the walk through Chapel Wood particularly as the trees are not yet in full leaf so you are walking in dappled shade with frequent glimpses of the valley to the right below. One such glimpse between the trees in Chapel Wood was of Lord’s Seat on the other side of the valley. A longer view across the valley with Barf, Lord’s Seat and Broom Fell on the skyline. As we walked along here we came across the two walkers who we had seen ahead of us in the fourth picture of this walk. They were stretched out on the grass beside the path, both of them fast asleep so we tip-toed past and tried not to disturb them. Its not a bad place for a snooze in the sun, is it? The Skiddaw fells come back into view as we continue along the path. A spell of sunshine brought out the detail which I thought merited a closer look at them, meanwhile the ewe across the field there is taking a closer look at us. The path we followed eventually brought us out on this old forest road and we took the upper section to return to the car and have a closer look at the deforested area. From the highest point on the forest road there is now a clear view towards the foot of Bass Lake. The situation on the ground looks very messy at present but nature will eventually put things back in order again. The tree felling was extensive so mother nature has quite a bit of restoration work on her hands up here. At this point we leave the forest road and follow the rough track between the brash and the trees …..
….. which after only a very short distance brings us to this stile and the path beyond …..
….. which then joins up with the path we walked along as we made our way over to Lothwaite. The recuperating foot was having trouble dealing with the angle of the slope since the injured ankle isn’t back to full flexibility just yet. Re-tracing our steps back down the path towards the church and then down the winding path through the gorse bushes …..
….. which brings us back to the gate and the little lane where our car is parked. Looks like a few more folk have also decided that a walk up Sale Fell would be a nice choice for a walk on a sunny afternoon, although, apart from the two sleeping walkers I mentioned earlier, we haven’t seen anyone at all. All in all a grand little jaunt but we could have done without the chilly wind for the first half of it.